Choose from one of the twelve popular kits below. If you have any questions about choosing the right Micro GeoMetrix™ tabletop display for your event needs please call us toll free at 1-855-536-3385 or contact us by email. 16.62″w × 46.75″h, weighs just 4lbs, 3 stretch fabric graphics. 31.37″w × 32.12″h, weighs just 5lbs, 4 stretch fabric graphics. 31.37″w × 32.12″h, weighs just 5lbs, 5 stretch fabric graphics. 46″w × 32.12″h, weighs just 6.5lbs, 6 stretch fabric graphics. 31.37″w × 46.75″h, weighs just 7lbs, 6 stretch fabric graphics. 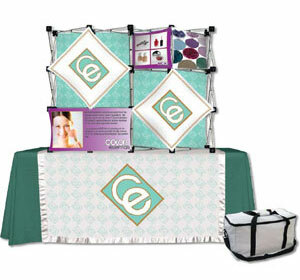 46″w × 46.75″h, weighs just 9.25lbs, 5 stretch fabric graphics. 46″w × 46.75″h, weighs just 9.5lbs, 6 stretch fabric graphics. 46″w × 46.75″h, weighs just 9.25lbs, 9 stretch fabric graphics. 60.75″w × 46.75″h, weighs just 12.25lbs, 7 stretch fabric graphics. 60.75″w × 46.75″h, weighs just 12.5lbs, 8 stretch fabric graphics. 60.75″w × 46.75″h, weighs just 12.25lbs, 10 stretch fabric graphics.